Sinking prices for uranium in the past three years have caused many of the world's biggest uranium miners to scale back production plans or defer projects, but two small U.S. producers are bucking the trend by planning to increase output this year and investors have sent their share prices surging as a result. Uranium prices are hovering near eight-year lows because an earthquake and tsunami struck Japan in March 2011, crippling the Fukushima-Daiichi atomic power plant, and leading to the shutdown of nearly all reactors in the country, which previously relied on nuclear sources for 30 percent of its power. The disaster crimped Japanese demand for uranium and fueled fears about a backlash to nuclear power. Last month, Japan included nuclear power in its draft energy plan, easing doubts about the industry and boosting uranium company shares. The spot uranium price, however, remains weak and companies scaled back production and halted expansion plans that curbed potential output by 20 million to 25 million lbs (9 million to 11.3 million kg), according to Edison Investment Research. That amounts to 16 percent of estimated global production last year. U.S.-based UR-Energy and Uranerz Energy Corp are going in the other direction. They are poised to ramp up production this year, helped by low costs and long-term contracts at prices well above current spot prices. Utilities locked in prices with the companies to secure near-term supplies, but they did so when prices were higher than now. The two miners may be making a contrarian move at just the right time. While Japanese demand remains a question mark, it is rising elsewhere as 70 reactors are under construction globally, part of a net increase of 93 expected over the next 10 years, and the most since the late 1970s, according to Canadian uranium producer Cameco Corp . Last year, there were 433 operating nuclear reactors worldwide. "There's a lot of nuclear development," said Francis McGuire, chief executive officer of Major Drilling Group International Inc, which offers drilling services to the mining industry. "We don't see it in North America so we close our eyes to it, but both in China and Eastern Europe, nuclear still is a viable option, and you've got to supply those generating stations." Uranium is a radioactive metal used to fuel the fission chain reaction in nuclear reactors, which generates heat that is turned into electricity. Uranerz' five-year agreements with U.S. utilities such as Exelon Corp price uranium around $50 or more per lb, against the current $35.50 spot price, said Paul Goranson, president and chief operating officer at Uranerz, who was talking on the sidelines of the Prospectors and Developers Association of Canada (PDAC) convention in Toronto. "We've got contracts that provide us the ability to have good cash flow," Goranson said this week. Uranerz hopes to start production this quarter, and is awaiting regulatory approvals for its mine in Nichols Ranch, Wyoming. The company is aiming to produce between 350,000 and 500,000 lbs in 2014, Goranson said. Colorado-based UR-Energy began production at its Lost Creek, Wyoming, mine in August and is already operating at close to nameplate capacity of 1 million lbs on an annualized basis. UR-Energy also has six long-term contracts with four U.S. utilities. Uranerz stock price has more than doubled since mid-November, closing at C$2.03 in Toronto on Tuesday, while UR-Energy shares have nearly doubled to C$2.06. By comparison, shares of Cameco, the world's third-largest uranium miner, have gained about one-third. The United States produces more nuclear-powered electricity than any other country, but it relies heavily on imports that are more costly than domestic supplies. "I don't have to go marketing uranium all around the world when there's a great market in my backyard," said UR-Energy Chief Executive Officer Wayne Heili in an interview. In situ mines, where producers like Uranerz and UR-Energy remove ore by injecting a solution into wells while leaving the rock in place, generally cost less to operate and come with lower environmental liabilities than conventional underground mines, said Dundee Capital Markets analyst David Talbot. In situ uranium mining occurs in the United States, Kazakhstan, Australia and Uzbekistan, making up more than one-third of uranium production. Not all low-cost producers can afford the risk of raising output in a slumping market. Texas-based Uranium Energy Corp cut production in its last fiscal year to 250,000 lbs because it did not have long-term sales contracts to hedge the risk of lower spot prices. UEC plans to eventually boost production to 2 million lbs, but is not offering guidance on how soon, said Chief Executive Officer Amir Adnani. 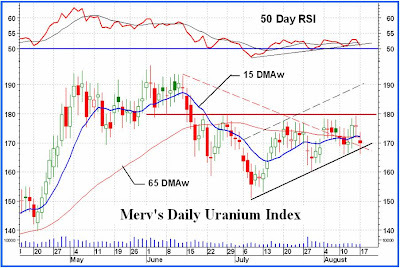 "Clearly we don't predict and can't predict short-term uranium prices," he said. "The timing could be two to three years. It could be four to five years." Cameco is considering eventual expansion of its U.S. in situ mines, but their cost of production is actually higher than its high-grade Canadian underground mines because U.S. volumes are much lower, said Ken Seitz, Cameco's chief commercial officer, in an interview. However, it is not easy to expand uranium mining in the United States. "The U.S. from a regulatory point of view is really complex at the state level, the federal level and the municipal level," Seitz said. "Could we look at expanding in the future? Yes, we could, but it will take time because of that very complex regulatory environment." For example, Cameco began the environmental impact statement process with the U.S. Bureau of Land Management for its Gas Hills in situ project in central Wyoming in 2009. A favorable decision was just issued in February 2014, but plans for construction are now on hold pending better market conditions. The uranium mining industry also faces several risks in the long run, including a large uranium inventory held by Japanese utilities that could overhang the market if reactors restart at a slower-than-expected pace, according to a report last week by Edison. But encouraging signs are emerging after three years of mostly bad news for the sector. UR-Energy is already looking to further boost output. Its acquisition of U.S.-based Pathfinder Mines Corp last year includes mine projects that were shut down in the 1990s due to low uranium prices. They should give the company a fast track to boosting production by another 10 million lbs starting in about three years, Heili said. By then, many analysts predict the world will be approaching a steep uranium supply deficit. Cameco sees world uranium consumption growing to 240 million lbs per year by 2023, while production falls to 120 million lbs. eToro is the most recommended forex trading platform for beginner and professional traders.